ANCHORAGE, Alaska (Reuters) – A remote but long-restless Alaska volcano rumbled to life on Saturday with three explosions and started emitting a continuous plume of ash, steam and gas in an area important to air traffic, scientists said. The low-level explosions at Cleveland Volcano, which lies below a major air-traffic route between North America and Asia, were not severe enough to cause a significant threat to planes, said experts. But the incident did prompt federal aviation authorities to divert some traffic north of the volcano as a precaution, said Rick Wessels, a U.S. Geological Survey geophysicist at the Alaska Volcano Observatory. “Based on the signals we can see, we think it’s continuously in an eruption right now,” Wessels said of the volcano, located 940 miles southwest of Anchorage. Cleveland Volcano, which has been restless since mid-2011, is on an uninhabited island in one of the most sparsely populated regions of the world, although major eruptions could cause potential aviation threats. Federal Aviation Administration officials could not immediately be reached for comment. The 5,676-foot volcano began oozing lava in the summer of 2011, causing lava domes to form at the crater and allowing pressure to build inside the peak. There have since been 20 to 25 explosions at sporadic intervals, he said. But Saturday’s trio of explosions was a new turn of events, he said. “We haven’t seen a phase like this where we’ve had multiple explosions,” he said. So far, the cloud streaming from Cleveland’s crater has reached only about 15,000 feet into the atmosphere – too low to cause damage to higher-flying jet airliners. “Once it gets to about twice that, we get really worried,” Wessels said. If the eruption becomes stronger, the National Weather Service will advise mariners to avoid the area, he said. Still, scientists have been put on around-the-clock duty to try to track Cleveland’s activities, he said. “It’s got us all paying attention. We’re not sure if it will escalate or do what Cleveland does, which is to settle down after small explosions,” he said. It is difficult for scientists to monitor Cleveland Volcano because there is no seismic equipment on the mountain. Alaska Volcano Observatory scientists rely on satellite data, signals from a different volcano about 50 miles away, eyewitness reports and other information. 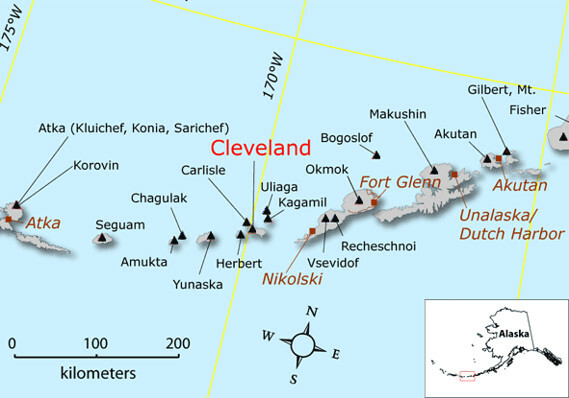 Cleveland Volcano, which occupies about half of Chuginadak Island, is the only one of Alaska’s 90 active volcanoes believed to have killed a person in an eruption. A soldier on the island during World War Two disappeared during an eruption, according to Observatory scientists.